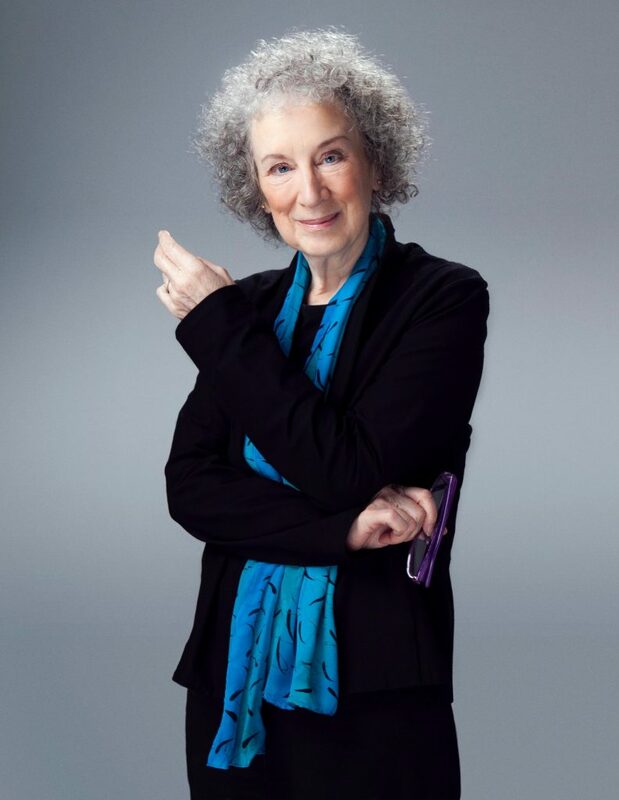 Acclaimed author Margaret Atwood (“The Handmaid’s Tale,” “Alias Grace”) will visit Syracuse University on Thursday, Oct. 25, and participate that evening in an on-stage conversation in Hendricks Chapel for the University Lectures series. The event, which is free and open to the public, starts at 7:30 p.m. Part of SU’s Family Weekend, it is co-sponsored by the College of Arts and Sciences and the Syracuse University Humanities Center, with media sponsor WAER. Atwood’s appearance is also part of the Humanities Center’s Syracuse Symposium programming, which is focusing this year on the meaning and impact of “STORIES” from diverse perspectives. American Sign Language (ASL) interpretation and Communication Access Realtime Translation (CART) will be provided. Atwood will be speaking with fellow novelist Dana Spiotta, associate professor of English in the College of Arts and Sciences. At the conclusion of their conversation, the floor will open for questions from the audience. The SU Bookstore will have a selection of Atwood’s books available for purchase in the Hendricks narthex before and after the event. There will be no book signing opportunity. The renowned Canadian author has more than 40 novels, non-fiction works, short story collections, children’s books, books of poetry, a graphic novel and a comic books series to her credit spanning her more than 50-year career. Atwood has been a recipient of the Man Booker Prize, the Arthur C. Clarke Award for Best Science Fiction, the Franz Kafka International Literary Prize, the Harvard Arts Medal, the Raymond Chandler Award, the Carl Sandburg Literary Award and a Guggenheim Fellowship, among more than a hundred honors. She has also received 26 honorary degrees. Two relatively new blockbuster adaptations of a pair of Atwood’s most notable books—“The Handmaid’s Tale” (McClelland & Stewart, Houghton Mifflin, 1985) and the mystery “Alias Grace” (McClelland & Stewart, Bloomsbury, Doubleday, 1996)—have brought a fresh recognition of her work to new audiences. The two seasons of the Hulu production of “The Handmaid’s Tale” have garnered nine Primetime Emmy Awards, including the 2017 award for Outstanding Drama Series. The series has also earned a Peabody Award, two Television Critics Association Awards, an American Cinema Editors Award, an Art Directors Guild Award, three Critics’ Choice Television Awards and two Golden Globe Awards, among other honors. The six-episode adaptation of Atwood’s murder mystery “Alias Grace” is currently available on Netflix, having debuted in November 2017. Her children’s book “Wandering Wenda and “Widow Wallop’s Wunderground Washery” (McArthur & Co., 2011) was produced as an animated children’s series. MGM is producing a series from her novel “The Heart Goes Last” (McClelland & Stewart, Bloomsbury, Nan A. Talese/Doubleday, 2015). And Paramount is adapting the three books in her MaddAddam series (McClelland & Stewart, Bloomsbury, Doubleday)—“Oryx and Crake” (2003), “The Year of the Flood” (2009) and “MaddAddam” (2013)—into a television series. In 2016, Atwood entered the world of graphic novels with “Angel Catbird” (Dark Horse), the story of a young genetic engineer who accidentally mutates into a cat-owl hybrid, which debuted at No. 1 on The New York Times Bestseller List. She has since written volumes two and three. And the complete 320-page collection was released Oct. 16. Atwood recently teamed with Eisner Award-winning illustrator Ken Steacy for a three-issue comic book series, “War Bears,” which tells the story of the early days of comics in Toronto and one fictional cartoonist’s struggles with the industry in the 1940s. Atwood is a founding trustee of the Griffin Poetry Prize and a founder of the Writers’ Trust of Canada, a nonprofit literary organization that seeks to encourage Canada’s writing community. In addition to her literary endeavors, Atwood is an inventor. In 2004, while on a paperback tour in Denver for her novel “Oryx and Crake,” Atwood conceived the concept of a remote robotic writing technology, the LongPen, that would allow someone to write in ink anywhere in the world via tablet PC and the internet. Spiotta is author of four novels: “Innocents and Others” (Simon & Schuster, 2016), winner of the St. Francis College Literary Prize and a finalist for the Los Angeles Times Book Prize; “Stone Arabia” (Simon & Schuster, 2011), a finalist for the National Book Critics Circle Award; “Eat the Document” (Simon & Schuster, 2006), a finalist for the National Book Award and winner of the American Academy’s Rosenthal Foundation Award; and “Lightning Field” (Simon & Schuster, 2001), a New York Times Notable Book. Spiotta is recipient of a Guggenheim Fellowship, a New York Foundation for the Arts Fellowship and the Rome Prize in Literature. In 2017, she received the John Updike Prize from the American Academy of Arts and Letters.